﻿ Ephesians 3:7 of which I was made a minister by the gracious gift of God, given to me by the operation of his power. of which I was made a minister by the gracious gift of God, given to me by the operation of his power. I was made a servant of this [gospel] by the gift of God's grace that was given to me by the working of His power. Of which I became a helper according to the gift of that grace of God, which was given to me according to the working of his power. Of this [Gospel] I was made a minister according to the gift of God's free grace (undeserved favor) which was bestowed on me by the exercise (the working in all its effectiveness) of His power. I was made a minister [of the Gospel] according to the gift of God's unearned favor, which was given to me according to the working of His power. Of which I was made a preacher, through that grace of God which was given to me in the measure of the working of his power. Of this gospel I was made a minister according to the gift of God's grace which was given me by the working of his power. for which I became a worker by virtue of the gift of God's mercy which by the exercise of his power he has given me. Of which I have been made a minister, according to the gift of the grace of God given to me by the effectual working of his power. of which I was made a minister, according to the gift of the grace of God given unto me by the operation of his power. 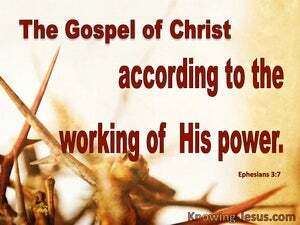 of which I became a servant, according to the gift of God's grace given to me, according to the working of his power. Of this gospel I was made a minister, according to the gift of the grace of God given to me by the effectual working of His power. whereof I am made a minister, by the gift of the grace of God given unto me, through the working of his power. It is of this gospel I became a minister according to the gift of the power of the grace of God, bestowed on me by the energy of his power. I became a servant of this gospel according to the gift of God's grace that was given to me by the exercise of his power. of which I was made a servant, according to the gift of that grace of God which was given me according to the working of his power. of which I became a minister according to the gift of the grace of God, given to me according to the effectual working of his power. of which I am made a minister, according to the gift of the grace of God, which was given unto me by the effectual working of his power. Of which I was made a minister, according to the gift of the grace of God given to me by the effectual working of his power. in which I have been appointed to serve, in virtue of the work which God, in the exercise of His power within me, has graciously entrusted to me. of which I was made a minister, according to the gift of the grace of God which was given to me according to the working of His power. of which I was made a minister, according to the gift of the grace of God conferred on me by the effectual operation of his power. who also has made us able ministers of the new covenant, not of the writing but of the spirit; for the writing kills, but the spirit makes alive. that I should be a servant of Christ Jesus to the nations, administering as a priest the gospel of God, that the offering of the nations may be acceptable, sanctified by the Holy Spirit. Who then is Apollos? and who is Paul? but ministers by whom you believed, and to each as the Lord gave. but by the grace of God I am what I am, and his grace to me was not in vain, but I labored more abundantly than they all, but not I but the grace of God with me. by whom all the body being joined together and compacted by the supply of every joint, according to the proportionate operation of every part, makes increase of the body to the edification of itself in love. if indeed you continue founded and established in the faith, and not moved from the hope of the gospel which you heard, which was preached in all the creation under heaven; of which I, Paul, was made a minister. 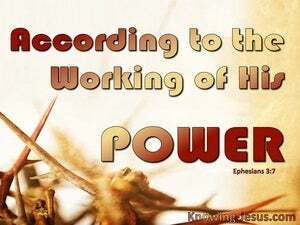 for which I also labor, striving with his power which operates in me with power. For this cause also we thank God without ceasing, that receiving the word of God heard from us, you received not a word of men, but, as it is in truth, a word of God, who also works in you that believe. and the grace of our Lord greatly abounded with the faith and love which is in Christ Jesus. perfect you in every good work to do his will, doing in you that which is pleasing in his sight through Jesus Christ, to whom be the glory forever; amen.